I reached some major goals this month in my art! I had a successful art table at Forest City Comicon after months of prep, and it feels so good to be done. 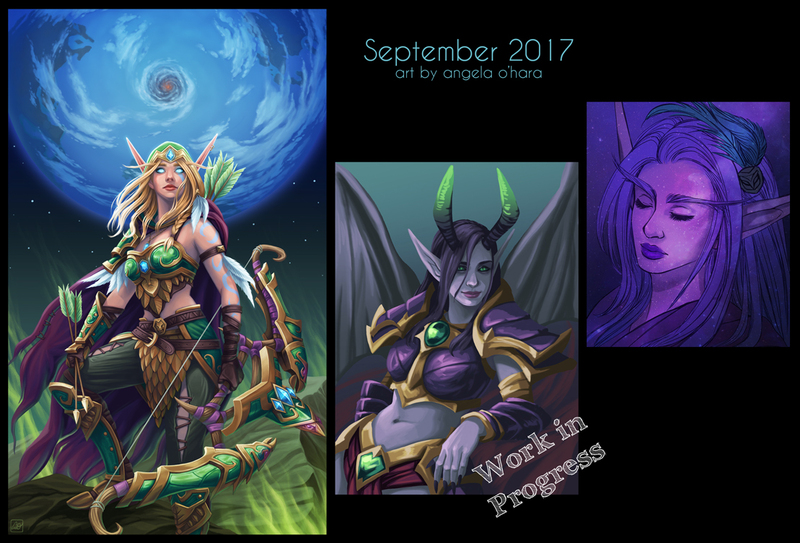 I took 17 days in September to work on a painting of Alleria Windrunner for the Shadows of Argus art contest, run by Warcraft. I won’t find out the results of the contest for a little while, but it’s already been worth the effort — my piece was retweeted by the Warcraft twitter account and got 2.7k likes, making it my most popular painting yet. It feels great to put all my effort in and be recognized! I started a new piece of Jaina fanart, but I’ve had to put it on the backburner a little bit while I prep for Inktober. I’m going to be drawing a small ink drawing for every day in October, and I’m trying to get ahead as much as possible. Looking forward to leveling up my ink skills!